Page Viewing Tips: This page contains a document window. The document is larger than shown in the window. To see the lower part of the document on a PC/Mac, use your cursor control to drag the right side scroll bar up/down. On a tablet like iPad, click the zoom out "-" sign at the bottom right of the document window to see more text and then zoom/shift using finger pinch/pull on the touch screen. On a Smartphone like iPhone, go to bottom of page, click "Web" version, then proceed as using a tablet . 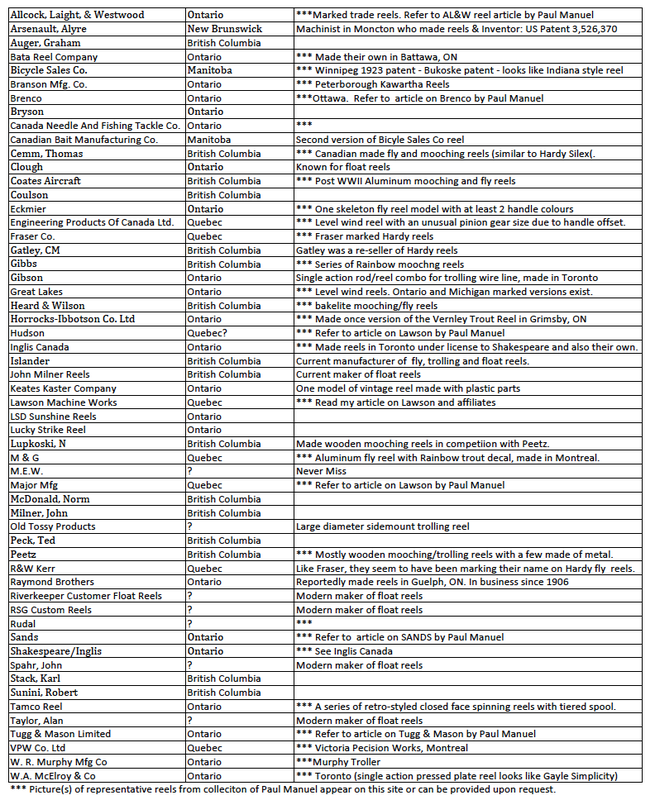 This consolidated list of Canadian Reel Makers includes makers and companies that made reels in Canada but also companies that distributed trade reels in Canada under their name (e.g. AL&W). The information was gathered from various online sites listed below, collector books and my own primary research. On my page of Canadian Marked Reels you will find pictures of some of the reels made by makers on this list. Pictures of additional Canadian reels can be seen at the links shown below. Canadian Lures by John Workman (the site has been recently locked by the owner so I disabled the link).